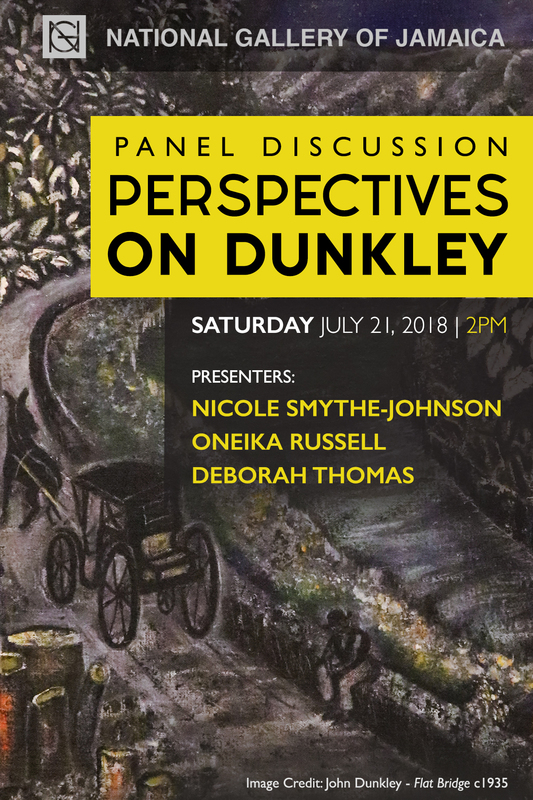 On Saturday July 21, 2018, the National Gallery of Jamaica will be hosting a panel discussion entitled Perspectives on Dunkley at 2:00 pm. Moderated by independent Jamaican curator and writer Nicole Smythe-Johnson who co-curated the critically acclaimed John Dunkley: Neither Day nor Night exhibition with independent US-based curator Diana Nawi; the discussion will feature presentations by Deborah A. Thomas and Oneika Russell. Conceptualized by Smythe-Johnson this panel will include a presentation by her on Dunkley’s significance from an art historical context; a presentation by Deborah A. Thomas on the role of culture in Jamaica’s Nationalist movements, and also a presentation by Oneika Russell from the perspective of an artist with a particular interest in Dunkley and his influence on other artists. This panel serves as part of the programming for the exhibition John Dunkley Neither Day nor Night, as well as its complementary exhibit Daylight come…Picturing Dunkley’s Jamaica. The critically acclaimed exhibition John Dunkley: Neither Day nor Night showcases a once in a lifetime compilation of the work of renowned Jamaican Intuitive artist, John Dunkley (1891-1947) and was originally shown at the Pérez Art Museum Miami (PAMM). Born in Savanna-la-Mar, Dunkley was of the generation of Jamaicans who travelled to Panama, Costa Rica and Cuba at the beginning of the 20th Century seeking opportunities for work and advancement. His moody paintings and whimsical sculptures reflect his life, experiences and views on Jamaica’s fledgling nationalist movement. Daylight Come…Picturing Dunkley’s Jamaica acts as a complement to John Dunkley: Neither Day nor Night. It explores the themes of tourism, immigration and the emergence of cultural nationalism during Dunkley’s lifetime. The exhibition contains rare photographs, artifacts and film footage from the turn of the century and shows the move from ethnographic and oftentimes disparaging depictions of Jamaicans, to the attempts at social and cultural empowerment by the Jamaican Cultural Nationalist movement of the early 1900s; providing further context to Dunkley’s creative output. Nicole Smythe-Johnson is a writer and independent curator based in Kingston Jamaica. She studied Humanities, Media and Cultural Studies at Macalester College in St Paul, Minnesota (BA, 2007) and Postcolonial Literary and Cultural Studies at the University of Leeds (MA, 2011). She has written for Terremoto, Miami Rail, Flash Art, Jamaica Journal and several other local and international publications. In 2016 she was awarded the inaugural Tilting Axis Curatorial Research Fellowship. She visited Scotland, Grenada, Barbados, Suriname and Puerto Rico, looking at curatorial practice in alternative and artist-run spaces. Currently, she is Acting Editor of Caribbean Quarterly, the University of the West Indies’ flagship journal. Deborah A. Thomas is a Professor in the Department of Anthropology at the University of Pennsylvania. She is also core faculty in Gender, Sexuality and Women’s Studies, holds a secondary appointment with the Graduate School of Education, and is a member of the graduate groups in English, Africana Studies, and the School of Social Policy and Practice. She is the author of Political Life in the Wake of the Plantation: Entanglement, Witnessing, Repair (forthcoming), Exceptional Violence: Embodied Citizenship in Transnational Jamaica (2011), and Modern Blackness: Nationalism, Globalization, and The Politics of Culture in Jamaica (2004). A graduate of the Edna Manley College of the Visual and Performing Arts, Oneika Russell completed a diploma in the Painting Department before leaving to study at Goldsmiths College in London in the Centre for Cultural Studies in 2003. While at Goldsmiths, Russell began to integrate her deep interest in combining the practice of Painting with New Media. She went on to complete the Doctoral Course in Art at Kyoto Seika University, Japan concentrating on Animation in Contemporary Art. Russell is currently a lecturer across The Fine Art and Visual Communication Departments at The Edna Manley College. The panel discussion is free and open to the public. Persons in attendance will also have an opportunity to view the John Dunkley: Neither Day nor Night exhibition and also Daylight Come…Picturing Dunkley’s Jamaica both of which close on July 29. Portraits and Abstraction: A Conversation from National Gallery of Jamaica on Vimeo. On March 29, 2018 the National Gallery of Jamaica held a panel discussion Portraits and Abstraction: A Conversation with the curators of Explorations V: Portraits in Dialogue and Explorations VI: Engaging Abstraction. It was moderated by independent curator Nicole Smythe-Johnson and the speakers were O’Neil Lawrence (Senior Curator) and Monique Barnett-Davidson (Assistant Curator) respectively. 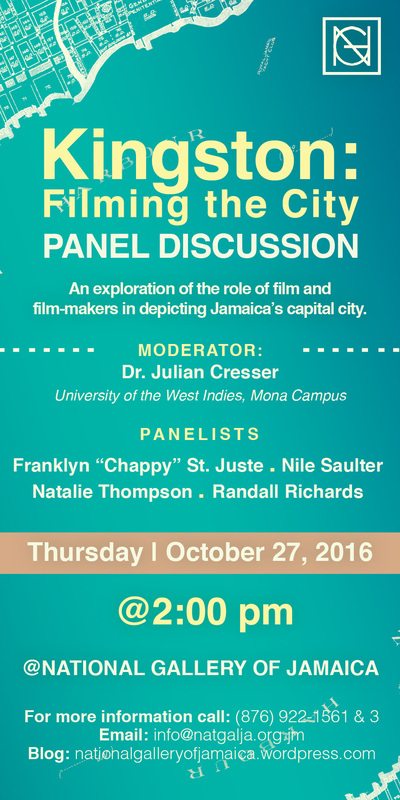 On Thursday, October 27, 2016, starting at 2:00 pm, the National Gallery of Jamaica will be hosting a panel discussion entitled Kingston: Filming the City. This event aims to explore the the work of filmmakers in depicting and interpreting Kingston life and its environs. Kingston: Filming the City is part of the educational programming associated with the NGJ’s current feature exhibition Kingston, Part 1: The City and Art, which opened on July 31 and will now close on November 5. The exhibition utilizes paintings, sculpture, ceramics, film and photography to explore the dynamic between Kingston’s growth as a major commercial as well as cultural centre and the development of Jamaican visual art practice and infrastructure. The focus on film for the panel discussion was inspired by the inclusion of two motion-picture works in the exhibition: Chaotic Beauty (2016), a video by emerging Jamaican digital artist Di-Andre Caprice Davis, and The Harder They Come (1972), the iconic Jamaican film directed by Perry Henzell and written by himself and Trevor Rhone. Both of these productions have featured Kingston not just as a backdrop to story-telling, but as a key location element that informs narrative progression and character development. Some have argued that The Harder They Come is also a portrait of Kingston and a time-capsule representation of urban life in Jamaica in the late 1960s and early 1970s. Kingston has featured in several other memorable, locally produced and international films, including the first James Bond film Dr No (1962), Rockers (1978), Dancehall Queen (1997), Third World Cop (1999), Better Mus’ Come (2010) and Kingston Paradise (2013). Kingston also serves as the locale and backdrop to numerous Jamaican and other music videos, such as Proteje’s Kingston Be Wise (2013). Franklyn “Chappy” St. Juste, veteran cinematographer who has been credited in films such as The Harder They Come (1972), Children of Babylon (1980) and Coolie Pink and Green (2009). St. Juste has also contributed valuable years of service to the Jamaica Information Service (JIS), Creative Production and Training Centre (CPTC) and the Caribbean Institute of Media and Communication (CARIMAC). Natalie Thompson, film producer and managing director of Cinecom. Some of Thompson’s acclaimed productions have included Third World Cop (1999), Knight and Day (2010) and the Marley documentary (2012). Nile Saulter, cinematographer and film director as well as founding member of New Caribbean Cinema. Some of his notable productions include Coast (2011), Pillowman (2013) and Everblessed (2016), a collaboration between himself and Canadian journalist Jeremy Relph. Randall Richards, emerging photographer, videographer and one of the founders of ARRC Creative Media Ltd. Richards’ recent productions have included the music video for music single by Reggae artiste Protogé, Kingston Be Wise (2013). Also as an accompanying mini-campaign to the Kingston: Filming The City panel discussion, persons are being invited to create 10 to 20 second videos about Kingston and post them to the NGJ Education Department Facebook page, using the hashtag #ngjkingstonfilm. The final day for posting will be on November 4, 2016. All posts will be reviewed by the National Gallery of Jamaica before appearing on the page’s timeline. The panel discussion is free and open to the public. Persons in attendance will also have an opportunity to view the Kingston, Part 1: The City and Art exhibition. The closing event for the National Gallery of Jamaica’s Digital exhibition will be a panel discussion and Twitter chat on the possibilities and potential of digital art and its role in redefining contemporary art. 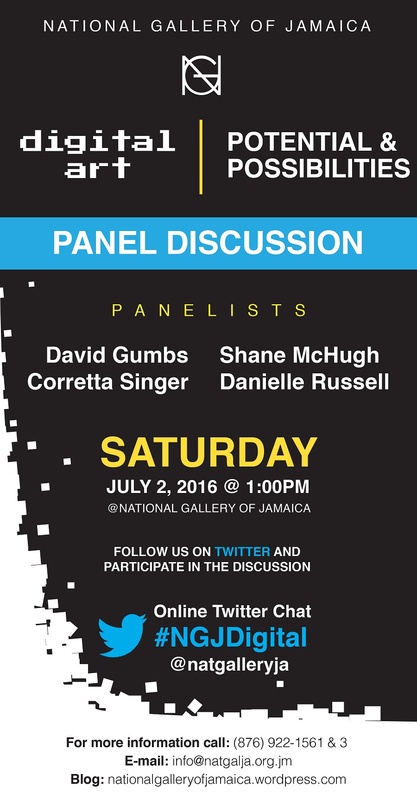 This panel discussion will be held at the National Gallery on Saturday, July 2, 2016, starting at 1 pm and will feature four digital artists, Corretta Singer, David Gumbs, Shane McHugh and Danielle Russell. The latter three are are represented in the Digital exhibition. What Makes Digital Art ART? – an exploration of definitions, understandings, commonalities and peculiarities of digital art. The Challenge of New Media – a discussion of how material value is treated in or can be ascribed to digital artworks; what are the conventional expectations of the ‘art object’ and how do the media used for digital art challenge these expectations? Exposure, Accessibility and Audience Reach – Does digital art afford greater/lesser potential for the aforementioned for the artists/designers as well as the audience? What are the ramifications concerning copyright and other legal protection for the creators of digital artwork? Rethinking Patronage – to what extent can the conventions of collecting artwork be applied to digital art? Is there a possibility that the traditional art collector may become marginalized as more artists produce in this way or can the rise in prevalence of digital artwork provide more diverse ways of encouraging varieties of patronage? The panel discussion will be accompanied by a Twitter chat for members of the audience and persons who are not able to come to the gallery for the event, including some of the artists in the Digital exhibition. All that is required is that they follow the National Gallery of Jamaica’s Twitter account, @natgalleryja and include #NGJDigital in their comments or questions. Participants in the Twitter chat can begin tweeting by 12 noon on the day. The panel discussion is free and open to the public. Persons in attendance will also have a final opportunity to view the Digital exhibition.